This entry was posted in Life as Queen (1543-1547), Life before 1543, The Family of Katherine Parr, The Tudors (1485-1603) and tagged 2nd Lord Vaux, anne boleyn, Boleyn ancestry, cheyne of fen ditton, Elizabeth Cheney, elizabeth cheyne, elizabeth tilney, elizabeth vaux, hans holbein, Holbein, Katherine Howard, katherine parr, lady anne cheyne, lady vaux, Parr ancestry, pinterest mistakes, thomas cheyne, Thomas Vaux by tudorqueen6. Bookmark the permalink. Hello, my name is Abigail Day. I am a direct descendant of Anne Parr. Thank you for clearing up this information. It is very confusing and I was under the impression that this portrait was of Lady Anne Vaux. Hi Abagail. Thanks for commenting! I’m always curious to how people descend from the Parr family. What is your lineage? 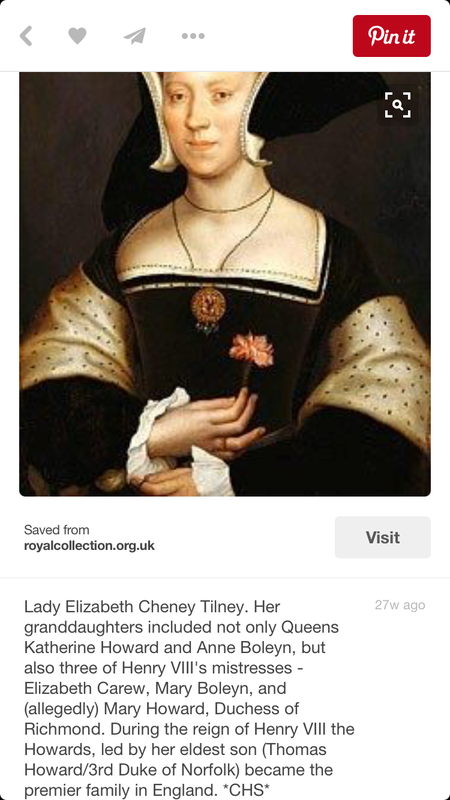 As for the painting, it has always been Lady Elizabeth Vaux (maiden name Cheyne) by Holbein. By her marriage to Thomas, she became a Baroness, thus obtaining the right to call herself “Lady”. Both Elizabeth and her husband were cousins to Queen Katherine and Anne Parr (and William) by their paternal grandmother and their maternal grandmother. Elizabeth was extremely close to the Queen. As for Lady Anne Vaux, I’m assuming you thought it was Katherine and Anne Parr’s aunt who married Nicholas after their grandmother died? In actuality, there was an Anne Vaux, who was (half) sister to Thomas, Baron Vaux who married Elizabeth. She was the daughter of Nicholas and Elizabeth (FitzHugh); grandmother to the Parr children. Elizabeth remarried after the death of her husband, Sir William c.1483. When the Lancastrian heir, Henry Tudor became King, Elizabeth decided to switch alliances; probably to stay in favor at court as she was a York. Nicholas was a Lancastrian who’s mother served Margaret of Anjou faithfully until Margaret’s death in exile! It may have been a match facilitated by the King’s mother, Lady Margaret. So, Anne Vaux would have been an aunt to both Elizabeth Cheyne and the Parr children. Now THAT Anne Vaux married Sir Thomas LeStrange. LeStrange has his own Holbein portrait, but I have yet to find one for his wife. Thanks again for visiting and commenting!